India’s ancient heritage plans to open at night for the first time. In the 16th century, they did everything. What we are doing now, they did. In the near future, tourists will be able to roam Hampi, the ruined city of past glory and marvel at its beauty in the moonlight. A highlight of the night will unquestionably be Virupaksha Temple. The temple is the soul of the Vijayanagara Empire, better known as Hampi. The Empire prospered between the 14th and 16th centuries. In 1986 it received UNESCO World Heritage status, and its popularity with tourists has soared. journey to the heritage site. “When we first came here, we arrived at 5am in the morning, we went up to Mantunga Hill, and we saw the overview of Hampi and it was really amazing. We took a lot of photos. We sent to our friends and they were like, “Wow, where are you?” It looked really great,” says Samy Vivian, from Germany. Known as Asia’s largest open-air museum, Hampi covers an area of 36 square kilometers. It was the capital of the Vijayanagara Empire. then pillaged for six months before being abandoned. Lost until the mid- 19th century, Hampi was rediscovered by local and international visitors. “My grandfather came here 80 years ago. He settled down here. It was not a tourism place, simply a pilgrimage place. So many people would come to worship, not just to see things. When pilgrims came, my grand father would offer them tea, coffee, or snacks, as a friendly welcome. Because he thought they were guests of God,” says local guide Manjunat Gowda. There are over a thousand monuments in this historical site. The style of monument divides into two kinds of architecture, religious or military. The evolution of Vijayanagara architecture is reflected in the Empire’s monumental structures. “In the 16th century, they did everything. What we are doing now, they did; hydrology, irrigation, agriculture, architecture, everything, so what we are doing now, in those days, they already did that,” says Deputy Superintending Archeologist N.C. Prakashn Nayakanda. post and lintel systems. The remains are a tribute to the ingenuity of builders in shaping a metropolis on this scale. 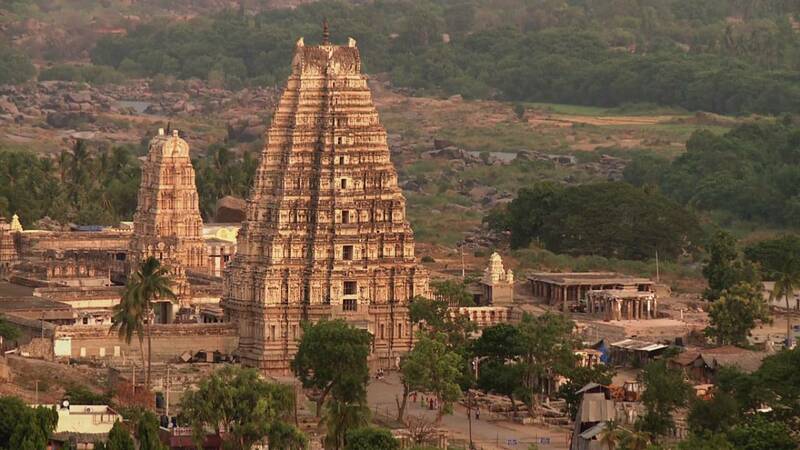 Looking at the monuments now, it is easy to imagine how grand and extravagant Hampi was during its glory days. It represents the human capacity to create a wonder of the world. Hampi is truly the pride of Southern India.